Sen. Bob Menendez, D-New Jersey, became the second high-profile second Democrat to announce his opposition to the Iran nuclear deal, delivering a lengthy speech Tuesday that outlined the ways in which he believes the U.S. was shortchanged. "I have looked into my own soul and my devotion to principle may once again lead me to an unpopular course, but if Iran is to acquire a nuclear bomb, it will not have my name on it. 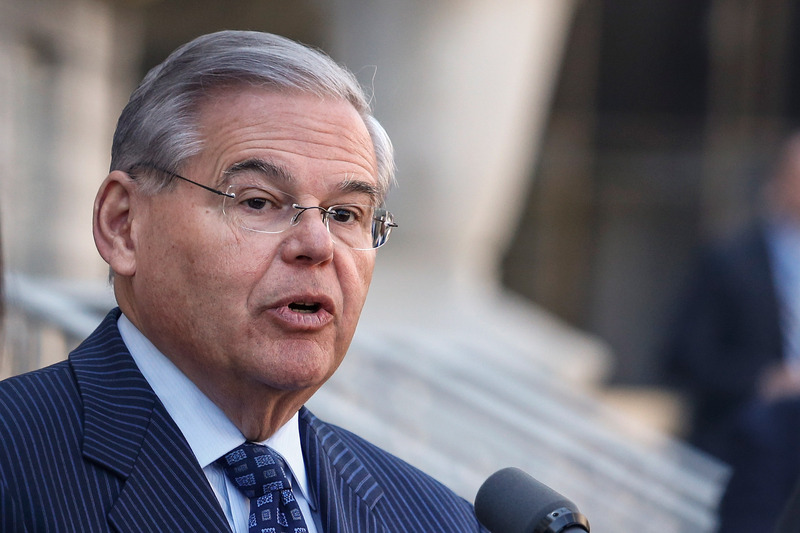 It is for these reasons that I will vote to disapprove the agreement and, if called upon, would vote to override a veto," Menendez said. Menendez's position comes as no surprise, given that he has been vocally skeptical of the negotiations for months. Still, his point-by-point opposition to the deal will likely become fodder for legions of Republicans and outside lobbying groups that are hoping to kill the deal. Earlier this month another powerful Democrat, New York Sen. Chuck Schumer, also announced he would vote against the deal, but did so with a short paper statement that he released in the middle of the first GOP presidential debate. Menendez's speech also comes one day after Senate Foreign Relations Committee Chairman Bob Corker, R-Tennessee, announced that he, too, would vote against the deal and seek to override a presidential veto of Congress' disapproval. How big a deal is Schumer’s vote against the Iran nuclear agreement? Speaking for nearly an hour in New Jersey, Menendez listed his concerns with the deal and suggested the U.S. had conceded far too many issues, from allowing Iran to develop any nuclear program at all to failing to force the country to disclose the past military dimensions of its nuclear program. "Let's remind ourselves of the stated purpose of our negotiations with Iran: Simply put, it was to dismantle all -- or significant parts -- of Iran's illicit nuclear infrastructure to ensure that it would not have nuclear weapons capability at any time. Not shrink its infrastructure. Not limit it. But fully dismantle Iran's nuclear weapons capability," Menendez said. He said Congress believed the U.S. was agreeing to lift sanctions in exchange for Iran rolling back all of its nuclear infrastructure, and he raised doubts about how quickly or effectively the international community would be able to restore sanctions if Iran violates the deal. He said that the sanctions relief, combined with a lifting of the arms and missile embargoes on Iran during the course of the next decade, will leave the U.S. in a "weak position." "We have now abandoned our long-held policy of preventing nuclear proliferation and are now embarked - not on preventing nuclear proliferation - but on managing or containing it, which leaves us with a far less desirable, less secure, and less certain world order," he said. "In reality, we have purchased a very expensive alarm system." He added that he believes the agreement will merely "kick today's problem down the road for 10 to 15 years." Menendez is calling on the administration to re-negotiate the nuclear program, and said he would be willing to authorize "a sweetener," or a temporary release of funds to Iran, as a "good faith down payment" to get them back to the negotiating table. He said a good agreement would force Iran to agree to permanent inspections of suspected nuclear sites, not seek centrifuge research and development, close of the Fordow enrichment facility, and reveal the past military dimensions of its nuclear program. He also said the agreement should last for more than 10 to 15 years and should have a clearer statement of what penalties Iran would face for violating the agreement. Menendez also rebutted President Obama's argument earlier this month that the people who oppose the deal were the same ones who voted in favor of the Iraq War. "I did not vote for the war in Iraq, I opposed it, unlike the vice president and the secretary of state, who both supported it. My vote against the Iraq war was unpopular at the time, but it was one of the best decisions I have ever made," he said. He also said that he arrived at his decision not like his Republican colleagues, "who reflexively oppose everything the president proposes," but out of thoughtful consideration. "But my support is not, and has not, been driven by party loyalty, but rather by principled agreement," he said.